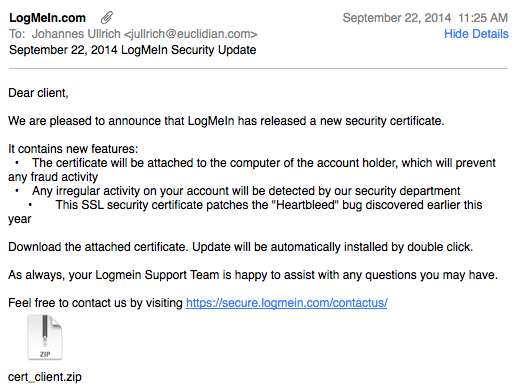 I just receive a pretty "plausible looking" e-mail claiming to originate from Logmein.com. The e-mail passed the first "gut check". The "From" address is auto-mailer@logmein.com. The only link inside the e-mail went to a legit Logmein URL. Of course, the .zip attachment did set off some alarm bells, in particular as it unzipped to a .scr (Screen Saver). LogmeIn does publish a SPF record, and the e-mail did not originate from a valid LogmeIn mail sender, so it should be easy to descriminate against these emails using a standard spam filter. Could you provide a link to the Virus Total report on the file? Logmein ain't free anymore, I wonder how many people will actually fall for this. I switched to teamviewer the second logmein went non-free. Even though it's a hard-fail, it's a mess. 474 characters all jammed into one TXT record and including all of salesforce.com's email servers. Was stopped @ the gate by my SW TZ105 with total secure package. There is not much data on it locally but shows globally a major spike. I will have to update my thread in regards to FW suggestions.